My wife and I were stopping by the local Gordon Food Service store to pick up a variety of items. And what did we spot by the front entrance of the store? 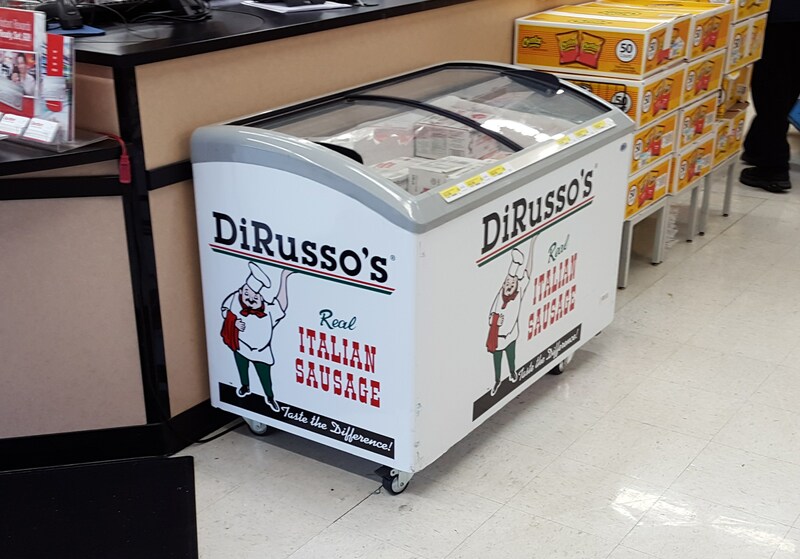 A DiRusso’s cooler loaded with their wonderful Italian sausage! We ended up buying a box, which we do periodically. We like to fry up our own pepper and onion mix that we top the sausage with on a good hoagie bun. Brings back memories of many trips to the Canfield Fair. The summer we moved to Columbus was a hard one for us. Our son, five at the time, broke the femur in one of his legs in a freak mishap. Usually, we would meet up on Labor Day weekend with friends at the Canfield Fair. 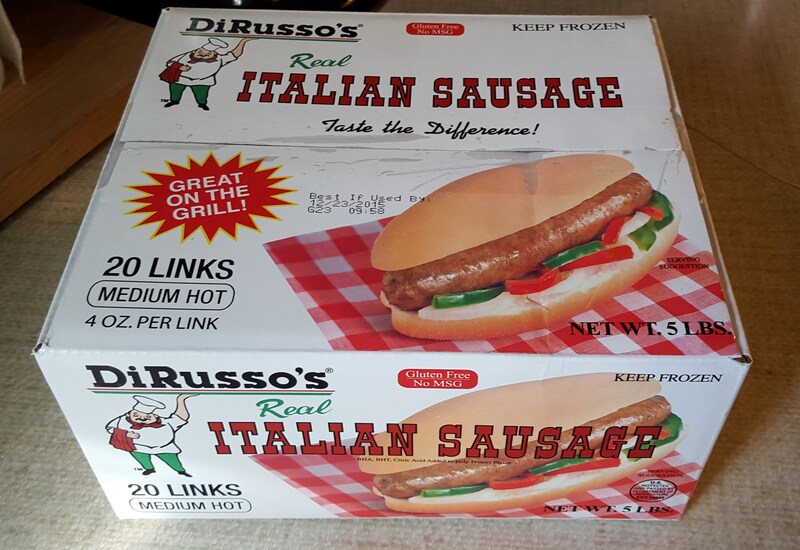 We couldn’t that year and so they brought DiRusso’s down to us and the whole house had that smell you notice as you approach a DiRusso’s concession. 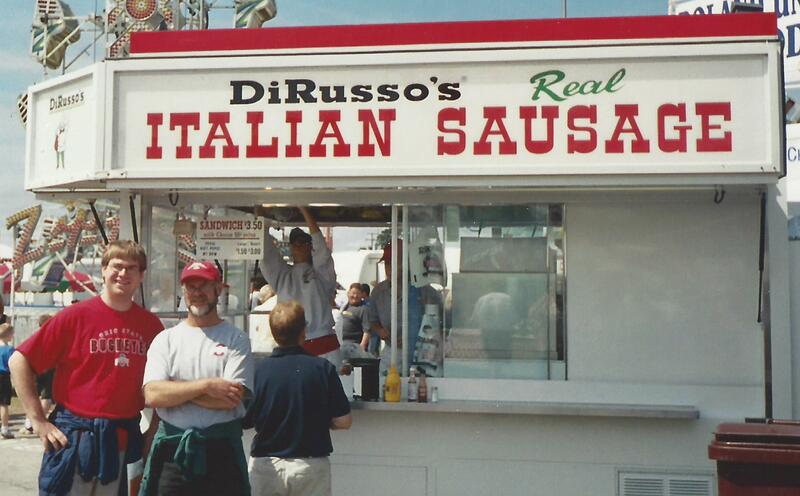 A DiRusso’s stand was always one of our first stops at the Canfield Fair. It kind of became a bonding experience with my son and we had this thing going of who could go hotter–kind of our version of chest thumping. All I can remember is the first bite into one of those sandwiches, particularly if a year had gone by without one, was heaven on a bun! DiRusso’s is a Youngstown original. From what I’ve been able to learn in a Vindy article, it all started with Adeline DiRusso’s sausage recipe and a family grocery in Lowellville run by her son, Augustine, “Augie” DiRusso. In the beginning, they just sold the sausage out of the store on East Water Street in Lowellville. By the 1960’s, Augie started setting up concession stands at the Mount Carmel festival in Lowellville, and at the Canfield Fair and other county fairs in the area. Back then, you could get a sandwich for 40 cents. Now they license concessions at over 100 events in the tri-state area. Nephew Robert DiRusso began working with the company and had his own trailer by age 16 in 1975. Eventually he took over the concession operation while Augie continued running their sausage plant in Lowellville. In 1993 Robert took over the entire operation from Augie and made the decision to go into retail. Eventually they moved their plant to 1035 West Rayen Avenue, its current location where all their products are manufactured and packaged to be distributed to more than three hundred stores in Ohio, Pennsylvania, West Virginia and New York. We’re glad DiRusso’s has made it to our city. We particularly like to get their meatballs and medium-hot sausage. They also sell turkey sausage, sausage patties, turkey meatballs, wedding soup meatballs, breakfast sausage, beef patties and beef hoagies. Makes my mouth water just to type the list. You can also buy direct from them through their website. Are you a DiRusso’s lover and what is your favorite sandwich or other product? I love them all! Can’t get them where I live but bring meatballs and sausage and breakfast links from Y-Town. Thinking about the wonderful smells of sausage sandwiches makes my mouth water! Thanks Michelle. I did note on their website that it looks like you can order direct from them! Glad we can get them in Columbus. Great article on this delicious Youngstown product, but you got some of your facts wrong about the origins. Archie DiRusso, one of Augie’s other nephews, is in charge of the routes at fairs and has been doing it 16. Robert DiRusso does all the factory work. Just wanted to give due respect to the family! Thanks for the corrections. The Vindy article I consulted didn’t have this info.